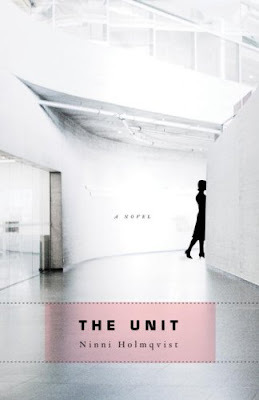 I'm quite pleased that I was given the chance to read and make a review of Ninni Holmqvist's debut novel, The Unit. And I have to say that I enjoyed every minute that I have read the book as it aroused my sense of awe and wonder if ever a place like the Reserve Bank Unit would suddenly show-up in the not so far future. The Reserve Bank Unit is a place for the "dispensables" (women over fifty and men over sixty who don't have "useful" professions or who are childless,) are gathered for biological materials and scientific testings. Basically, the Reserve Bank Unit is a luxurious slaughterhouse. The occupants in the reserve are able to live extravagant lives being able to eat gourmet food and shop for luxury items without having to pay for them. Well, they do have to pay in the form of organ donations and participation in life-threatening experiments though. The main protagonist of the story Dorritt Weger, submitted herself to the Unit because she was childless and her career as a freelance writer wasn't considered a job that could benefit all of society. Dorritt who was unhappy in the outside world, in the community, is suddenly infused with desires to live her own life again as she met a partner in the unit and that they had a baby together. It's just too bad that a tragedy had to occur to destroy her dream to become a mother. I won't say anything more about the story because I don't want to spoil it for everyone. The Unit had exreme effects on the outside world too because cases of teen pregnancies and infant kidnappings arised because no one wants to be taken away and live the remaining of your life participating in several painful experiments and having your organs taken one by one. This then gives us the question of how valuable human life is to society that they are able to treat humans just as walking useable organs and lab rats. I highly recommend this book to everyone. The story has a very controversial topic that will surely spark your interest. Although the book is more on the female psyche, having read it from a male perspective, I still enjoyed the book.